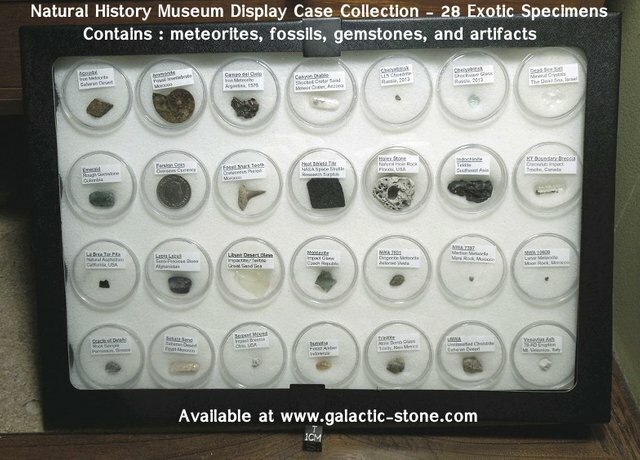 This display case contains the most interesting, unusual, and exotic specimens from around the world and solar system. This collection contains meteorites, fossils, gemstones, artifacts, amber, and other rare materials ranging from contemporary dates to ancient times. It would take a long time and a lot of money to assemble a collection like this, and now you can have this kit without the huge investment of time and money to track down every individual specimen. This collection is like having an entire natural-history museum in one display case. All specimens are 100% genuine and acquired from reliable sources with solid provenance. Each specimen comes in an acrylic container with data label that has information about each piece. The specimens can be removed from their cases and handled if desired. All of the containers are arranged in a handsome glass-lid display case that measure 8-inches by 12-inches. This display would make a unique conversation piece in your home, office, or observatory. Refer to the list below. Note, each specimen is unique and the appearance may vary slightly from one kit to the next. Ammonite - extinct sea creature fossil (from Morocco) that contains semi-precious gem material, polished and beautiful. Agoudal - iron meteorite from an ancient impact crater in the Saharan Desert. Canyon Diablo Sand - sand from world-famous mile-wide meteorite impact crater in the Arizona desert. Chelyabinsk Meteorite - fragments of the massive meteorite fall over Russia in February 2013 that captured world attention. Chelyabinsk Shockwave Glass - shard of glass broken by the intense shockwave of the exploding Chelyabinsk meteorite. Chicxulub KT-Boundary Breccia - Iridium-rich remnants of the catastrophic asteroid impact that wiped out the dinosaurs. Dead Sea Salt - rounded salt crystals from the shores of the Dead Sea in Israel. Florida Holey Rock - mythical "holey rock" relic collected from a Florida beach under the New Moon. Foreign Coin - an old coin from a land far far away, well worn and with character from decades of passing hand to hand. Fossil Shark Tooth - a fossil tooth from the Cretaceous-period when dinosaurs walked the Earth and huge sharks swarmed the seas. Indochinite Tektite - strange black impact glass from a huge meteorite impact millions of years ago in what is now Vietnam. La Brea Tar Pits - jet-black asphaltum (natural tar) from the world-famous tar pits in California. Lapis Lazuli - a unique blue gemstone mineral that comes from the mountains of Afghanistan - home to the most prized Lapis deposits. Mars Rock - Martian shergottite meteorite fragment that comes from the surface of Mars. Moon Rock - lunar troctolite meteorite fragment that originated from the surface of the Moon. Mount St. Helens Ash - volcano ash from the devastating and historic volcano eruption in 1980 in Washington state. Oracle of Delphi - pumice rock fragment from the legendary site of the Oracle of Delphi in Greece. Pallasite Crystal - cosmic peridot fragment that is a piece of translucent olivine crystal from a pallasite meteorite. Serpent Mound Breccia - impactite rock from an ancient impact crater in Ohio that is also an pre-Indian burial mound. Petrified Wood - beautiful fossilized wood that is millions of years old and found the desert southwest USA. Saharan Desert Sand - sand collected from the ancient trade routes of the Egyptian Saharan Desert. Space Shuttle Heat Shield - sample of the ceramic tile used to protect the belly of the Space Shuttle during atmospheric re-entry. Trinitite - fused desert glass from the historic first atomic test during the Manhattan Project at the Trinity Test Site in 1945. Unclassified Stony Meteorite - an unanalyzed stony meteorite found by Bedouin nomads in the deserts of Morocco. Vestan Meteorite - sample of regolithic breccia meteorite from the Solar System's brightest asteroid - 4 Vesta.